We went in for my 22-week ultrasound on March 29, 2017. To describe how we were feeling…excited was an understatement. We already knew the baby’s gender at the 13-week mark, but this was the sonogram that would confirm the baby was indeed a boy. It was instantly confirmed; we were having a boy! When we received this exciting update, we were brought down quickly by some other unexpected news. I will never forget the look on our ultrasound technician’s face when she was performing the sonogram. She stopped speaking to us, and was wearing a concerned expression. When she finished the sonogram, she escorted us to a tiny, cold room, and told us a physician would come in soon to speak with us. She shut the door. I knew something was wrong, and my heart sank into my chest. It felt like an eternity had passed by before the physician came in to speak with us. When he introduced himself as the high-risk obstetrician, I instantly knew this news would not be good. What could possibly be wrong with our baby? I just remember bits and pieces of the conversations now. “Your baby has a very severe, life-threatening conditional called a congenital diaphragmatic hernia (CDH). Most of the baby’s abdominal organs are already in his chest cavity, pushing his heart and lungs to the right side of his chest. This could prohibit proper lung growth.” I had never even heard of this condition before. We left the office in a panic, not knowing what to do. We were given very little information regarding options or resources available to us, so we researched everything ourselves. I will never forget this next phone call from my dad, when he told me: “Kylee, everything is going to be OK. Asher is going to make it. Texas Children’s Hospital offers experimental fetal surgery where they will go into Asher to put a balloon in his trachea, which will help promote lung growth.” Before we knew it, I was on the phone with admissions at Texas Children’s, and my first appointments were scheduled at their Pavilion for Women. I was there for three days in a row, the three longest days of my life. I felt as if we were getting hit again and again by bad news, but the faculty at Texas Children’s gave us so much hope for our son. During these initial visits at Texas Children’s, I underwent fetal magnetic resonance imaging (MRI), a fetal echocardiogram, an anatomy ultrasound and several consults with physicians from pediatric surgery, cardiology, neonatology and maternal-fetal medicine. Our pediatric surgeon went over the fetal MRI results with us, and explained the confirmation behind Asher’s official diagnosis for severe, left-sided CDH. Asher only had 15 percent proper lung volume, and his stomach, colon, gallbladder, spleen, liver and intestines had already traveled into his left chest cavity. 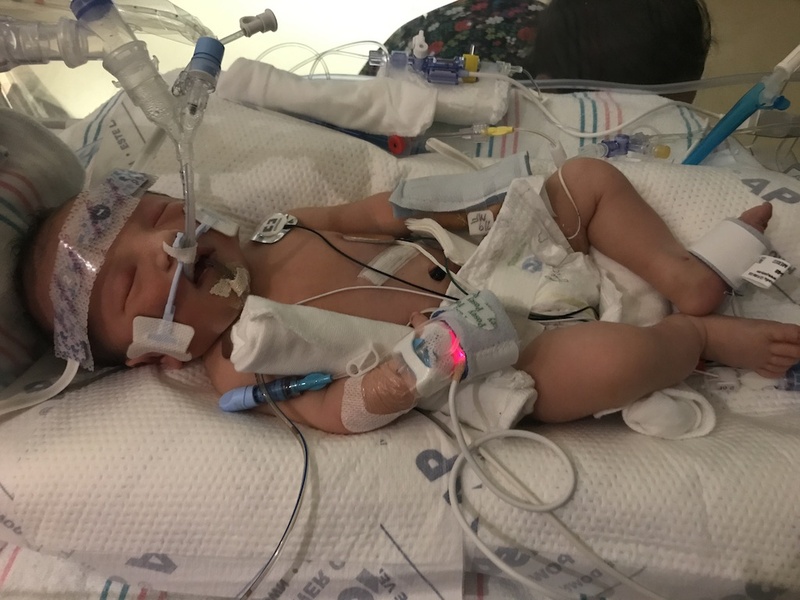 The surgeon explained how Asher had a 10 percent chance of survival, but we were pleased to find out we qualified for a fetal procedure called fetal endoscopic tracheal occlusion (FETO). “If you have any faith at all, right now is the time to lean into it, hard,” said the surgeon. Bryson and I both knew what had to be done. Of course, we had to consider the risks that came along with the surgery, but this was our only hope for Asher. This fetal procedure took place on May 8, 2017. I was at the 27-week mark of my pregnancy. During the procedure, surgeons successfully inserted the balloon into Asher’s trachea. While the balloon was in place, we had to be within 2 miles of the hospital at all times. So, we rented out an apartment near the Texas Medical Center. I spent many days and nights in that apartment praying for my baby to overcome this horrible condition. When I was 34 weeks pregnant, we did another fetal MRI. The results showed that Asher’s lung volume had shifted from 15 to 30 percent. His lung-to-head ratio had also jumped from 0.7 to 1.5. Asher’s balloon was removed on July 7, 2017 at my 36-week mark. Finally, Asher was born on July 9, 2017. We had a big team waiting in the delivery room for Asher to arrive. Once he was born, he was swiftly taken away and intubated. When he became stable enough for transport, he was escorted to Texas Children’s level 4 neonatal intensive care unit (NICU). When Asher arrived, he needed more respiratory support. It was decided Asher should be put on high-frequency oscillation ventilation. On July 11, Dr. Vogal repaired Asher’s hernia by placing all the abdominal organs back into his abdomen, and secured them with a patch to act as his diaphragm to allow more room for his lungs to grow. The next day, Asher was switched back to the conventional ventilator. He remained intubated for four weeks, and was then trialed with continuous positive airway pressure (CPAP) for four more weeks. When he was 8 weeks old, Asher was re-intubated due to a steady increase in his carbon dioxide, and remained this way for nine more weeks. Since Asher’s diaphragmatic hernia was so severe, it lead to bronchiole and tracheal malacia, which would get better with time, nutrition and growth. Asher also required a tracheostomy and ventilator support to keep his airway open. With passing time, we were able to decrease ventilator support and hope to eventually have him de-cannulated. After 193 days, we were able to bring our happy, miracle baby home on Jan. 18, 2018. I can’t put into words how grateful we are for our team of maternal-fetal medicine specialists, neonatologists, nurses, respiratory therapists, vascular access specialists, surgeons, fellows and many others to mention. During our first consult, the maternal-fetal medicine specialists told us we were “part of [their] family now,” and I know they meant it. This team went above and beyond for us. I collected all of their personal cell phone numbers and was told I could contact them anytime if I had any questions or concerns. It was really hard to believe they actually took care of other patients, because they spent so much time with us! I can admit that the NICU was a scary place to be, but the nurses there always made me feel comfortable. Through all of the ups and downs, I’m so thankful to share that I have my happy, 7-month-old baby with me at home at last. I don’t think I’ll ever be able to thank our team from Texas Children’s Hospital enough, but I hope each person knows how much they mean to our family.